So while on the subject of round ups, I’m going to put my hip boots on and take a giant leap into yet another highly charged political quagmire considered by many horse advocates as “taboo” - because this time, it’s not only about the government, it’s about those who are suppose to be our friends. It started at the Wild Horse & Burro Summit held in Las Vegas, NV this past October, where one of the hot topics was the upcoming wild horse gather in the Sand Wash Herd Management Area (HMA) in Colorado. The Sand Wash wild horses were one of two herds to be the focus of a five year-long fertility control study on PZP by the Humane Society of the United States (HSUS) in partnership with the BLM. The wild horses in Utah’s Cedar Mountain HMA are the others slated for study in this partnership. It took at least a year and a half to set these studies up and the October 2008 round up was suppose to be one of the “few” Deputy Director Henri Bisson admitted to authorizing removals from - despite no place to put the wild horses or money to feed them once they were captured. First, let me start with a couple of the highlights within the Summit’s political scene among the advocates themselves that clued me in to the potential controversy brewing about the Sand Wash round up. It began during the Saturday panel discussion of “Behavioral Effects of Immuno-contraception in Wild Horse Management; The Use of Porcine Zona Pellucida (PZP) on Wild Horses”. Two of the panelist, Dr. Allen Rutberg, current advisor to HSUS in charge of approving all of BLMs fertility control proposals over the last few years and long-time researcher of PZP (I’ve found records dating back of his extensive involvement since at least 1996) and Ginger Kathrens, The Cloud Foundation’s Executive Director and producer of the documentary series, Cloud: Wild Stallion of the Rockies, began a heated exchange about PZP’s effects on the Pryor Mountain wild horse herds. Though the fiery exchange was brief, it was unquestionably intense as these two went head to head. Ginger insisted that since applying PZP to the Pryor Mountain mares, she had noted some very unusual effects, such as foals consistently born out of season, mares remaining infertile much longer than they were suppose too, some not reproducing at all and constant fighting among the stallions due to the mares monthly cycles keeping them on “high alert” because the pro-creation drive could never be fulfilled. Allan expressed obvious frustration as he cut her off time and time again to declare the effects of PZP were well documented and her allegations were completely unsubstantiated. Yet Ginger continued to insist she knew the Pryor Mountain wild horses better than anyone, knew their history, knew their habits both before and after PZP, that its application was really impacting the herds and demanded HSUS do some follow up work and look into what she had found. While it was obviously disturbing watching these two go at it, I must confess, I became excited as the realization dawned on me that HSUS was going to be intimately involved in the monitoring of the Sand Wash herds on a regular basis. The opportunity to have an independent, scientifically based team on the ground working side by side with BLM, which was also concerned with the humane treatment of the herds, was a rare opportunity indeed! However, as the Summit progressed, my excited quickly waned for two reasons. The first was, after Dr. Rutberg’s presentation on “The Application of PZP in Wild Horse Management”, I had an opportunity to ask how long HSUS had been studying the Sand Wash herds and gathering data prior to applying PZP. Turns out, it was only around March of 2008 the HSUS Team began their work in Sand Wash and even then, based on my current understanding, it was only focused on counting and identifying the wild horse population within the HMA prior to the round up. So I followed up my initial question with, “How could the effects of PZP be properly evaluated if HSUS had little to no independent information about the herds, their reproduction rates or behavioral patterns prior to the injections?" Though I don’t remember Dr. Rutberg’s answer specifically, I walked away with the impression this lack of information was deemed “unimportant” to either the study or measuring PZP’s effects and I found both response and attitude a bit unsettling. The second reason I had been excited was HSUS could provide an independent count of the Sand Wash wild horse population. According to BLM’s records, as of February 28, 2007, the BLM reported 202 wild horses in the Sand Wash HMA. Yet just one foaling season later, BLM reported the population was now 392, so obviously the increase of 190 wild horses in one year merited further investigation, at least to me. I thought this would be of significant interest to HSUS too, especially since the focus of the study was to be population increases and reproduction rates. However, my assumption was definitely wrong about HSUS being enthusiastic in pursuing an answer to this question. Instead, it seemed I was a bit of a black sheep for even asking the questions and pointing out the discrepancies in BLMs population reports. When it came to the Sand Wash wild horses specifically, HSUS couldn’t really say what happened before their arrival in March but they were darn sure about 400 horses had been accounted for with their own eyes. So, as far as they were concerned, this ended the discussion about BLMs funny numbers – at least around me. So once the Summit was over, I began looking into the Sand Wash HMA, the upcoming gather, the background of HSUS’s involvement, and this is what I have found so far. *Wild horse removals have been pretty consistent. BLM has removed wild horses in 1995, 1998, 2001, 2005 and now again in 2008. Click Here to see a rather detailed BLM generated article on the 2005 Sand Wash round up. Listening to BLM tell it back then, they seemed pretty sure how many wild horses were out there, both before and after the round up (but then again, aren’t they always?) Apparently, BLM and HSUS seem content to support the idea that somehow, BLM missed approximately 200 wild horses for over a decade. *Despite ongoing questions about wild horse population numbers, when I recently asked HSUS what the prior reproduction rates of the Sand Wash wild horses were, Heidi Hopkins, now in charge of HSUS’s Fertility Control Program responded by stating she had no immediate information available and suggested I check with BLM. *Out of the other side of their mouth, BLM then stated, “This document re-affirms the AML based on the monitoring of range and vegetation conditions”, (meaning BLMs established wild horse Allowable Management Level was just fine). If this is true and the AMLs are valid, why are ranchers significantly reducing their livestock grazing to allow for “high numbers of wild horses” for over a decade, even when BLM is removing them every three years to the low end of AML? As for the results of those vegetation and monitoring conditions that “re-affirmed” the wild horse AML, here is a table of “Actual Wild Horse Use” BLM provided on page 38. Notice anything strange here? Despite removing 220 wild horses in September 2005, BLM fails to report their numbers ever going down, don’t they? BLM just keeps adding wild horses to the forage consumption chart like nothing every happened. Again, how can BLM "affirm" wild horse AMLs are valid when, according to this chart, wild horses were never removed? I asked BLMs Rangeland Management Specialist Kathy McKinstry to please explain this but I never received a reply. There were also some things equally as odd in the livestock section. According to BLM, ranchers had been taking voluntary non-use due to drought and high wild horse numbers. Here is the chart BLM published to substantiate this claim. Notice the Animal Unit Months (AUMs) in the Sheeperherder Springs allotment and how they go down in 2006 to merely 41 AUMs. Just a drop in the bucket from what the rancher is authorized to use, right? Checking BLMs Grazing Reports for those allotments overlapping the Sand Wash HMA, all livestock is grazed somewhere between September and June every year. Now here is another chart BLM provided in the Sand Wash wild horse removal EA showing “Utilization Levels on Browse & Grasses”. Again, follow the Sheepherder Springs grass utilization levels as reported by BLM from 2005-2007. When these reports are put together, some rather puzzling questions begin to emerge. If BLM removed 220 wild horses in September 2005 and reported the utilization levels on the grasses were only 23% prior to the removals while simultaneously reporting the permittee in Sheepherder Springs only used a total of 41 AUMs throughout all of 2006, why did the utilization level on grasses more than double in the Spring of 2006 - six months after the wild horses were removed? Who ate the forage and why did the percentage of grasses consumed continue to decline while wild horse numbers and livestock use continued to increase from that point on? These were the kinds of questions that I was hoping an “independent humane observer” such as HSUS would be able to address. Except evidence is beginning to suggest HSUS may not be so “humane or independent” after all…. Photo taken from BLMs Internet Adoption website: #7188, captured from the Sand Wash HMA in Colorado, September 2005. Since we are on the subject of BLM contracts and potential “conflicts of interest”, here’s another issue wild horse advocates have been urging BLM to address; the almost exclusive contracts awarded to the guys flying the helicopters that capture our wild horses and burros. The two heavy hitters in the “removal business” are Cattoor Livestock, Inc. and KG Livestock, also known in the wild horse and burro circles as ‘Cook and Cattoor’. These two companies are the predominate contractors BLM and other government agencies (such as U.S. Fish & Wildlife) use to remove wild horses and burros across the West. Cattoor Livestock, Inc.’s website has an entire section devoted to the commendations they have received for their work with the first letter they have posted written by none other than Velma Johnson, aka, “Wild Horse Annie” herself. Those praising Dave’s work also include the International Society of Mustangs and Burros, the Billings Field Office regarding the Pryor Mountain wild horses and a whole host of various officials praising their humane handling and techniques. Click Here to view. According to government records, since 2000, Cattoor has netted over $13.4 million dollars(1) and Cook/Heaverne over $6.8 million dollars(2) for removing wild horses and burros from public lands. While both contractors are used extensively, Dave and Sue (that’s his wife) are often interviewed because of their involvement in the Wild horse and Burro Program and the removals they perform, such as the recent Reno Journal Gazzette article about the removal of 460 more wild horses in Nevada where Dave stated, “These horses are dying out there and we’re not taking care of the problem”. Click Here to see photos of the dying horses on the drought stricken range. Dave’s got a lot to say about the Wild Horse and Burro Program. He expresses his views on the condition of the range, the need for the removals he has made such a handsome living off of, how well they treat the foals during the removals as well as many choice tidbits about special interest groups needing to back off the BLM, leave them alone to let them do their job and lies being circulated on the internet stating contractors and BLM do not want and sometimes do not allow people to watch wild horse round ups. Dave even references a September 2007 round up in Colorado as evidence that these “lies” just aren’t true! By the way, that Colorado round up was the source of a filming project David Glynn was part of. Mr. Glynn posted an article about his experience during the removals titled, “Ten Days in Disappointment Valley” and here, Dave and Sue Cattoor are just as candid about their opinions as they are on their website and as Mr. Glenn pointed out in his accounting, “they are strong advocates of killing, in their words “a humane way to dispose of excess horses” and support the Burns Amendment”. Dave’s not shy either about advocating “humane destruction” in any fashion as is clearly evident on his website as he discusses the “welfare sanctuaries”, aka, long-term holding facilities, how no one wants them, how these now captured wild horses are “unusable” and if not adopted, should be put down. It’s also apparent Dave’s a big fan of horse slaughter as he also takes the time to discuss his views on how the horse slaughter ban effects wild horses, which includes how BLM will be negatively impacted by increased competition in the market place and he even provides a link to “The Unintended Consequences of a Ban on the Humane Slaughter (Processing) of Horses in the United States”. If you have the stomach for how "humane" American horse slaughter was, check out Animal Angels' recent release of hundreds of photos taken at our American horse slaughter plants by Clicking Here. From here, Dave leads right into the question, “Was Dave Cattoor convicted of a felony?” as he offers his explanation for how he, Cliff Heaverne and four others were involved in “conspiracy and use of aircraft to capture wild horses and aiding and abetting” in 1990 and offers to provide any court documents to those interested regarding his involvement. 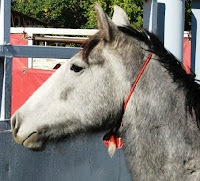 Since there’s an interest in getting both sides of the story, while Dave’s website offers the public a variety of photos about wild horse round ups and the range, here’s a pictorial report that offers a slightly different version of wild horse round ups compiled by a group of horse advocates regarding some of the issues being raised about Cook and Cattoor titled, “The Use of Helicopters to Remove Wild Horses & Burros From Public Lands”, June 2007. 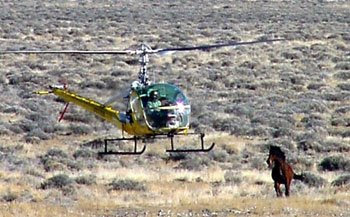 This pictorial includes comments and testimony presented to the BLM at their legally required annual review regarding the use of helicopters to capture wild horses and burros. Click Here to view and wait for it to download. It is also interesting to note that some of the very issues brought to BLMs attention over a year and a half ago highlighted in the report above are still being reported as occurring during the round ups, as this recent revealing American Wild Horse Preservation Campaign Testimonial, “Colorado, 2008 – Government Contractor Exposed, Part 2” by Carol Walker, clearly shows. Click Here to view. “While convicted, that does not preclude the fact he does excellent work for us”, Worley said. While BLM has explained that Dave Cattoor has “paid his dues” and Dave himself offers his explanation as to why he was convicted of mustang hunting, conspiracy, aiding and abetting and is very open with his opinions regarding the need to humanely kill unwanted wild horses (after all, everyone is entitled to their opinion), what’s your opinion about Cattoor Livestock, Inc. and Cook/Heaverne’s almost exclusive multi-million dollar contracts with BLM to round up America’s mustangs and burros posing a “conflict of interest”? Photo at top courtesy of American Wild Horse Preservation Campaign and Return To Freedom. towild horse and burro safety?" Allegations, Hearsay and What the F*%k? It started the day after the National Wild Horse and Burro Advisory Board's Reno Meeting held on November 17, 2008 as an Anonymous phone call spilled through the airwaves into the ears of the International Fund 4 Horses. Prone to receiving a wide variety of odd, unverifiable and even crank correspondence, there was little that could be done with the Anonymous "tip" besides being highly disturbed. Contacting media outlets about it's ominous warnings only brought a general consensus that it was most likely a prank by wild horse enemies delighting in the potential of a wild goose chase (excuse me, wild horse chase) and causing unsubstantiated panic to encourage more BLM adored propaganda of hysterical rants from the wild horse community. *WATCH ALL HOLDING FACILITIES* as early as next weekend, but especially around Thanksgiving. The BLM have been fudging the numbers on what horses are where and how many. The Plan: 200-300 geldings are being moved about 40 at a time to Mexico for slaughter; 400-500 mares moved, then killed and buried at various facilities. Ditches for the bodies are being dug right now out in the desert, near an airbase so would be difficult for civilians to get out there. Will drive them to the spot, shoot them, then bulldoze them into the ditches and cover them up. Pulling off such a dastardly deed around Thanksgiving would be nothing new as it was the day before the Congressional Thanksgiving break the Burns Amendment was slipped in and the timing of the "tip" smacked of historical irony. It also bode well for covert activities, as most people would be busy with holiday festivities, family and friends. 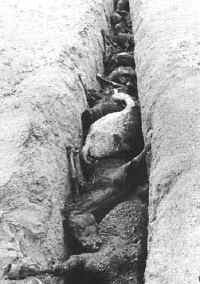 Mass execution of wild horses and burying them in ditches would also be nothing new as this now famous photograph uncovered by investigator Gail Snider of American Horse Protection Association clearly shows one of the rare pieces of evidence ever publicly released illustrating what BLM was caught doing to wild horses AFTER they became federally protected! As for the geldings, after reading Valerie James Patton's report last year regarding the suspected illegal exports of only geldings through a "non-slaughter" loophole in the law found in the USDA's Santa Teresa's Livestock Export reports, shipments that totaled thousands of geldings a year beginning just a few months after BLM re-wrote their new sales authority contract and resumed selling wild horses for as little as $10 each, the Anonymous Tipsters suggestion that geldings would be trucked off to Mexico for slaughter had potential too. Fresh off the plane from the Advisory Board's meeting and still feeling warm and fuzzy from BLMs feel-good assurances that our captured wild herds would be safe a while longer, the Anonymous Tip hit me like a ton of bricks with its wake up call! Trust BLM? The words from Deputy Director Bisson at the Las Vegas Wild Horse and Burro Summit came floating back; "We will not gather any more wild horses due to budgetary constraints with just a few exceptions personally approved by me, even in Wyoming where we risk lawsuits if we don't". Though not an exact quote, it was something to that effect. Reflecting on the 3,000 pieces of hard won evidence flushed down the toilet in the Del Rio Grand Jury Investigation in 1996, evidence gathered by highly trained and skilled law enforcement officers showing BLM knowingly sent wild horses to slaughter in a variety of complicated schemes and much of it implicating BLM personnel as personally participating in the easy money of free horse meat, the chances of an Anonymous Tip, which was completely impossible to verify, wasn't going to go very far, was it? One month later on December 19th, 2008 between 10 p.m. and 8:30 a.m., 200 geldings and 100 mares plus their foals disappeared from BLMs Palomino Valley Holding Facilities (PVC). According to a local wild horse advocate (who's identity is being kept anonymous here for obvious reasons), most of these were identified as wild horses that arrived last summer from the Nevada Wild Horse Range (aka Nellis) and North Stillwater gathers. These wild horses were well known by the observer due to the length of time they were held at PVC and a little less than three weeks before they disappeared, these same wild horses had been extensively photographed over the course of an entire afternoon. According to their report, despite being held captive for six months, which gave BLM more than enough time to geld all the stallions, many still failed to have BLM's trademark freezebrand on their necks and some were even devoid of the telling rope collars with their dangling metal ID's. On December 30, 2008, 200 more mares disappeared from PVC and when someone finally answered the phone a few days later, they explained the horses were taken to Fallen, NV, where a feedlot and slaughter auction yard doubles as a BLM "overflow" facility. According to Tim, PVC's current manager, once wild horses are shipped there, they are no longer available for adoption or for public inspection as it is a private facility. It's kind of interesting to look at BLMs posted Short Term Holding Facility statistics (granted, they are only valid as of November 3, 2008), which show many of their facilities are well below capacity while Gary's place is chuck full of those $3.21 per day wild horses. Click Here to view while you can as BLM will undoubtedly be updating these numbers soon. Not to say there is anything suspicious about BLM funneling wild horses and burros to a private overflow facility that specializes in selling animals to slaughter or the fact that Google Maps show closer views of the nearby Fallen Air Force Base than they do of Snow's. 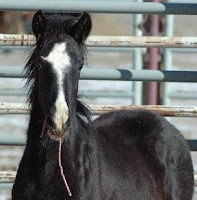 There's probably nothing wrong with the fact that BLM is currently offering foals on their Internet Adoption site from Snows because there mothers were most likely shipped to all the long-term holding facilities BLM can't afford to pay for. I'm quite sure that would be the official reason given if BLM is ever questioned about it. After all, though no wild horses have yet to arrive at PVC, BLM is merely making room for the 1,400 - 1,500 more about to come through the door due to the Callaghan Complex wild horse round ups still underway in central Nevada. And I'm sure it was just an oversight by BLM that many of those same wild horses now blocked from public inspection failed to be freezebranded or come with a necktag as Gary and Co. sorted through who goes to the long term holding facilities once they arrived. Of course, Gary's sterling reputation is much brighter after a few years have passed since the December 2001 publication of "Snow Job, Corruption, Collusion and Insider Deals with the Bureau of Land Management"(3), which reported on some of Gary's deals with local ranchers (such as Bud Johns from the now zeroed out Silver Peak HMA/Livestock allotment due to lack of forage). Apparently in 2001, a stink was being raised about how Gary was circumventing legal grazing permits by running cattle through "unofficial" partnerships with known Sage Brush Rebel Ranchers Wayne Hage and Ben Colvin as their special applications to BLM for Temporary Non-Renewable Grazing Permits were then sold to Gary. However, these days Gary doesn't need to sneak cattle into other permittees allotments anymore as BLM has rewarded him this year with authorizations to run livestock on the Arambell, Ruby Hill and Ralston allotments, which just so happen to coincide with the Fish Creek and Saulsbury Herd Management Areas. Only the most paranoid of wild horse advocates (or those who have become jaded over the years) could possibly see a connection between having the right to run livestock trucks through Herd Management Areas by an operator that holds wild horses for the BLM in a facility the public can't access (and gets paid very well for it too! ), which accepts wild horses that aren't freezebranded or identified in anyway that also just happens to be a livestock feedlot and slaughter auction yard. After all, if BLM doesn't see a conflict of interest with this set up, why should anyone else? Today, things seem to be going pretty good for Gary of Gary Snow's Livestock and Grain as the BLM proposed to grant Gary authorization to run 600 head of cattle under yet another Temporary Non-Renewable Grazing Permit in the Ralston Allotment. To view BLM's and Gary's proposal, Click Here and don't forget to check the map on the back page. For those of you who may be feeling bad about Ben Colvin being squeezed out of his own livestock operations on the Ralston allotment to accommodate Gary's cattle, no worries! In October, BLM proposed giving Colvin & Son a Temporary Non-Renewable Grazing permit for 1,400 head of cattle too! Click Here to view the whole proposal and here's the map of the area. In case you are wondering what the horizontal lines are, that's the Saulsbury wild horse Herd Management Area BLM removed 233 wild horses in and around in February 2007 to maintain the thriving natural ecological balance(4). As BLM continues to save our wild horses from starving to death on a drought stricken and decimated range, it's good to know "temporary forage" is still available for both Gary's and Colvin's cattle to the tune of 2,000 head at the bargain basement rate of $1.35 per month. As for the Anonymous Tip, it will just have to be filed in that very thick folder of allegations within the Wild Horse and Burro Program that were never substantiated. (4) Stone Cabin Complex Post-Gather Report, February 2007. Apparently, big plans have been in the works for many of the wild horse Herd Management Areas in the Ely District, much of it affecting many of the now zeroed out “unsuitable” habitats. In December 2008, two new massive proposals were released by the BLM and U.S. Fish and Wildlife Service (USFWS) in partnership with the BLM, which are currently open for public comments. USFWS has just released a Draft Plan to help mitigate impacts to wildlife and Threatened and Endangered Species as a result of booming development now on the horizon in the Southern Lincoln County Area. The groundwork for this plan actually began in the good ole year of 2000 and it references the planning efforts of the new Ely RMP occurring at the same time, though it is apparent this was written long before the current plans release last month as it only references the 2005 Ely RMP with “projections” of the Proposed RMPs release in 2007; no mention of its approval in August 2008. Spanning several hundred pages, it describes the new plans “Purpose and Need for Action” as; Need for Incidental Take by Lincoln County, City of Caliente and Union Pacific Railroad, which in essence means these three entities are getting the rights to “incidentally” destroy habitat and species alike of the Desert tortoise and Southwestern willow flycatcher. The proposal covers almost 1.8 million acres. It also includes various legislative histories affecting the area such as the Lincoln County Land Act of 2000 and the Lincoln County Conservation, Recreation and Development Act of 2004 as well as myriad of other lesser but still important plans cranked out by the Nevada Legislature, the County Commission and various local bodies. The Lincoln County Conservation, Recreation and Development Act of 2004 had a similar breakdown of disbursements of funds but no actual dollar amount was included. This second monstrosity is about building and operating a coal-fueled electric plant north of Ely and the obvious miles of transmission lines necessary to bring it to Las Vegas. BLM is projecting an impact of almost 14,000 acres, a drop in the ground water known as "drawdown" by at least a foot for at least 84 miles surrounding the plant, two feet of drawdown to impact springs, streams and lakes around the area, eight active water rights expected to include a drawdown of between 5 to 10 feet predicted (is that why the Ely RMP was based on “watershed” – because they knew they are about to lose a ton of it? 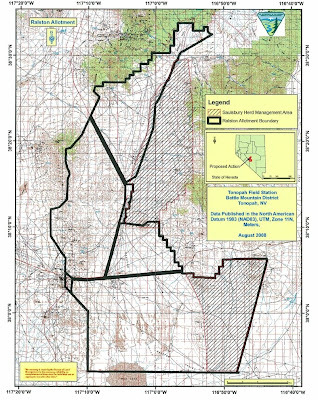 ), 81 acres of Desert Tortoise habitat permanently eliminated, as well as affecting up to 51 grazing allotments and 10 Herd Management Areas (except this proposal is also outdated as it fails to incorporate all those new HMAs just created and still uses the now zeroed out ones). A list of Socioeconomic impacts included a variety of figures of expected revenue to be generated from the proposal such as almost $125 million from the plant itself, $104 million from the Electric Transmission Facilities and $2.5 million for Water Facilities. The impacts to the wild horses and their Herd Management Areas were barely a blurp on the radar screen but after diligent digging, here is what was found buried on a map buried in the back. Click Here to view. The energy transmission lines from the South Plant site will skirt the outside of the Butte HMA, run smack dab through the middle of now zeroed out Jakes Wash HMA, barrel through the zeroed out White River HMA, clip a portion of the now zeroed out Seaman HMA, veer East to run right through the middle of the Dry Lake HMA, oops, excuse me, the Silver King HMA, shoot between the Rattlesnake and Highland Peak HMAs, most of which had the majority of their acreage eliminated from further “management”, skirt the outside boundaries of the now defunct Applewhite and Delamar Mts. HMA, where a segment veers off through through the Southern half, heads near the Meadow Valley Mountain HMA (also zeroed out to protect the Desert Tortoise) and re-aligns again to the main transmission line that lumbers towards Las Vegas to reach the Harvy Allen Substation. As one unsuspecting Nevada rancher told a wild horse advocate recently when asked how they acquired such a beautiful piece of property, the rancher replied with a wink and a grin, “The secret is getting rid of the horses”. The actual link to USFWS website and full proposal can be found at the bottom of the Dear Interested Party Letter. Comments are due by February 18, 2009 and can be mailed or faxed to: Nevada Fish and Wildlife Office, 4701 North Torrey Pines Drive, Las Vegas, NV 89130 or faxed to 702-515-5231. Please refer to EIS filing number DES08-39 when submitting comments. Photo of Dry Lake Wild Horse captured in December 2006.